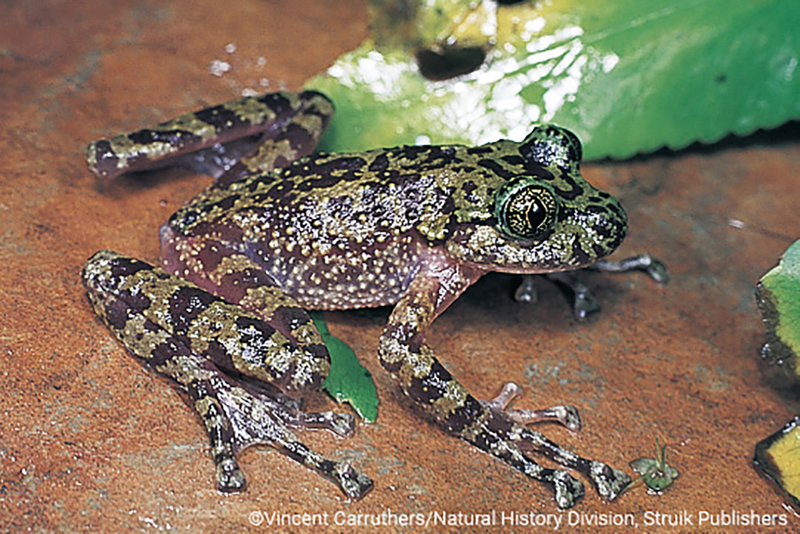 The Critically Endangered Table Mountain ghost frog is found only on the slopes of Table Mountain, South Africa, occupying an area of only 4 km². The Table Mountain ghost frog has very few close relatives and is one of only seven species in its entire family, Heleophrynidae. These frogs diverged from all other amphibians around 140 million years ago, in the Early Cretaceous. This was around 70 million years before Tyrannosaurus rex walked the Earth! This species is adapted to life in fast-flowing mountain streams. Their tadpoles possess sucker-like mouthparts, which they can use to climb up wet, vertical rock surfaces around their streams at night. This frog has been called a “trogloxene” species; an occasional cave visitor that does not complete its full life cycle within them. The main threats to the Table Mountain ghost frog are the spread of alien vegetation, frequent fires, and the construction of water storage reservoirs on the mountain affecting the consistency of stream flow. Intensive eco-tourism is also a potential threat given that Table Mountain is one of South Africa’s most visited natural locations. The whole of this species’ range is incorporated in the Table Mountain National Park. A monitoring programme by Western Cape Nature Conservation is in place. This species is endemic to the southern, eastern, and marginally western slopes of Table Mountain, in the Western Cape Province of extreme south-western South Africa. It occurs at an altitude of 240-1,060 metres above sea level. The species is concentrated in wooded ravines and valleys in clear, swift-flowing perennial streams in areas of high rainfall. The year-round water supply is necessary to facilitate the year-long development of tadpoles. Breeding occurs in spring and summer during the low stream flow.